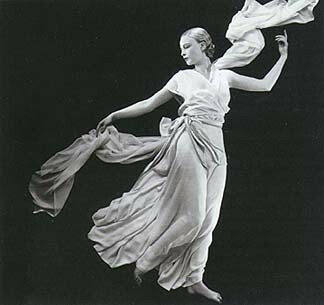 » Blog Archive Madeleine Vionnet: A retrospective at the Musée des Arts Décoratifs. Think 1930s MGM classic glamour and subtle sophistication, and unconsciously the fluid lines of Madeleine Vionnet come to mind. The French-born designer is the subject of an exhibition at the Musée des Arts Décoratifs (through January 31, 2010). Naturally, being a deco devotee, I was not content with just going along myself, but also persuaded my visiting mother and aunt to come and be converted. The show spans two floors, with dim lights to keep the delicate fabrics in top condition. Stepping through the doors was, for me, akin to entering the walk-in closet of my dreams. If Chanel was the undisputed queen of chic daywear, in whose clothes you can be free to move, Vionnet was her evening equivalent. Displayed in case after case, the exquisite dresses all owe their effortless elegance to the drape and the cut rather than to embellishment. True, some are covered in stunning beadwork in muted tones, but these dresses are even simpler in shape in order to make the cut the jaw-dropping emphasis. One trumps the other. Never both at full volume. Vionnet, again like Chanel, based her work on a “less is more” philosophy, following the prevailing trends of the art deco 1920s and ’30s. Vionnet invented the revolutionary method of cutting fabric on the bias; working with Moroccan crepe, silk and satin, she created clothing that draped the wearer’s figure and clung to curves in sensuous folds. Marlene Dietrich (personal favorite) and Greta Garbo were two legends of the silver screen known to have worn her designs, which led to her style being extensively copied by Hollywood costumiers. She was a groundbreaker in her time, not just for the bias cut or the use of satin—unusual in her day—but also for inventing the halter neckline. Her aim was to create dresses of timeless style and beauty, taking inspiration from classical Greek friezes in which the clothing seems light, airy and in motion. She even went so far as to say that fashion did not interest her, but that she was instead concerned with creating a wearable work of art. Vionnet is not the household name that Chanel is; while equally talented, Vionnet shunned all publicity and avoided self-promotion. What really struck me as I moved among these creations was how intensely wearable they still are. Their timeless appeal transcends their 80-year vintage (my aunt and I spent quite some time compiling our fantasy wardrobes)—proof that Vionnet achieved her aim of standing somehow apart from the whirlwind of fashion.